Call ACF at 813.235.6357 to learn more about VoIp service! If you are looking for an easy way to cut costs, a VoIP solution for your phone system is the answer. VoIP phones offer lots of flexible features and a fraction of the cost of a traditional phone system. This means that you get all the big business features you need in a business phone without spending a big business budget! ACF Consulting, a VoIP phone provider, can set you up with a sophisticated phone system that will save you hundreds of dollars on your phone bill. To learn more about all the features VoIP phone systems have to offer, contact us today! ACF takes the concept of personal service literally. We want to understand your business environment and your objectives so that we can recommend the best VoIP solution for your company. We realize businesses grow and change naturally over years, which is why we take the time to make sure every solution we provide our customers can grow and change with them. We work with all sorts of companies both small and large and no matter what the size, we are committed to providing the best customer service possible. Our personal approach sets us apart from other VoIP phone providers. Want to learn more about VoIP? 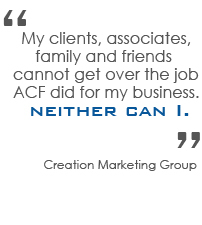 Call ACF today at 813.235.6357 and speak to one of our experience IT technicians. We can help you determine the best VoIP solution for your business that can save you hundreds of dollars on your phone bill. Contact us today to get started!